Infinitely the same - but better! 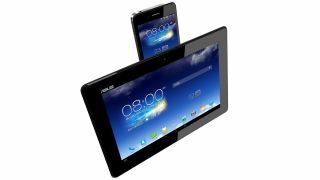 Not a moment sooner than expected, Asus has launched the new PadFone Infinity. The shocking news is that there are no major shocks. The predicted new 2.2GHz quad-core Snapdragon 800 processor is a fairly decent jump from the 600 found on the original, though. The internal storage has been downgraded from its predecessors 64GB to 16GB and 32GB options, but Asus has added a microSD slot to make up for it. For those of you hankering for a display update, things are much the same here with a 5-inch full Super IPS display. The new Infinity comes with Android 4.2 out of the box which should make the UI a fair bit zippier. Though other specs, including the 13MP rear camera and 2MP front camera, remain the same. That camera is now joined by a new feature called PixelMaster however, which enhances pictures by condensing pixels into a high quality 3-megapixel photo. The new Infinity also compatible with current PadFone Infinity accessories including the Station dock. It will go on sale in Taiwan to begin with. Asus has set a US price of $640 (about £402, AU$687) for the 16GB and $710 (about £446, AU$761) for the 32GB option. An Asus spokesperson told us that there are currently no plans for this hitting UK shores just yet, but that could well change.